Keto & Alcohol: Can Alcohol Be Keto-Friendly? Drinking liquor can in fact deepen your level of ketosis, but will slow weight loss down. Ingestion of alcohol has effects on liver metabolism, in which more ketones are produced as you drink more. When your liver is taking care of the alcohol you drink, it’s being converted to a triglyceride which can also positively affect the production of ketones. Below you’ll find short and quick versions of everything you can drink. Scroll down the page to read a more in-depth explanation on each low-carb alcohol and what you should commonly avoid. Here’s a short list on what you can drink when you want to consume low-carb alcohol. 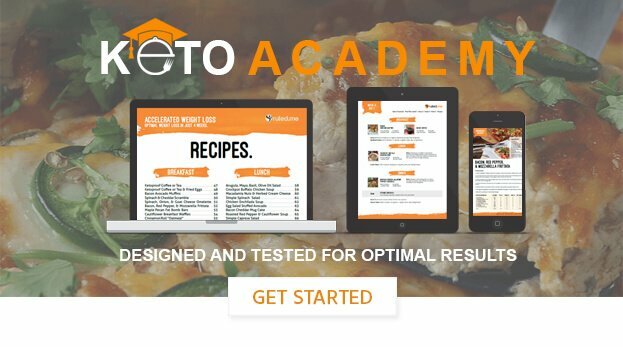 Try not to stray away too much from the suggested list, but if you want more options scroll down and you’ll see a much more comprehensive list (including brands and carb counts)! Beer. Bud Select, Miller 64, Michelob Ultra. Most beers are very high in carbs so they should be avoided. Typically lighter beers will have nutrition information online, so make sure to check beforehand. Wine. Unsweetened/unflavored champagne, dry red wine, and dry white wine. These are going to be the lowest carb wine that you can consume. These typically range in the 4-5g net carbs per glass (5 oz.) range, but you have to be careful. Liquor. Vodka, rum, gin, tequila, whiskey. All unsweetened and unflavored liquor will have 0g net carbs. 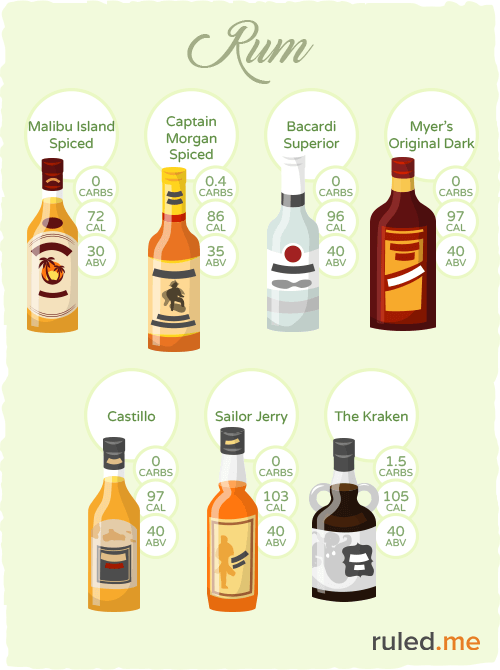 Liqueurs and most mixers do have carbs, so avoid them. Below, you’ll find our full cheat sheet on alcohol with the respective nutrition values. Scroll down below to see in-depth information and specific brands that you can consume. All of our nutrition information is based on a serving size of 1.5 oz. per shot of liquor, 5 oz. per glass of wine, and 1 can/bottle for beer. Sparkling water. This is one of the best choices, allowing you to flavor how you’d like. Diet carbonized water. Normally these come in lots of different flavors and varieties, so double check the nutrition labels. Diet soda. Many different brands and sweeteners are used in diet sodas, so double check the nutrition labels. Sugar-free energy drinks. Many brands like Monster, Red Bull, and Bai5 sweeten with erythritol and can be consumed with alcohol. Water enhancers. Many brands like Mio, Stur, and Crystal Light offer water enhancers that you can mix in with sparkling water (or normal water) to mix with your alcohol. Bitters. These are normally a mixture of herbs that are infused into an alcohol base to make a concentrated flavor. Some will contain sugar so it’s recommended that you make these at home. Alcohol does have some health benefits, so you don’t have to feel too bad when you have a glass of wine or a shot of liquor. In moderate consumption, alcohol lowers the risk of cardiovascular disease, can aid in cancer prevention, and can even improve insulin sensitivity. As a general rule of thumb, liquor will always be the best thing to consume if you’re watching your carb count. Typically liquor with 40% alcohol by volume (80 proof) or higher will have 0g net carbs. Remember to be careful about mixers and cocktails when you’re at a bar. Many of the added ingredients will have added sugars (this includes all simple syrups, juices, and fruit add-ins). Vodka is usually made from a grain base such as potatoes, rye, or wheat, and runs around 35 – 50% alcohol by volume. When you’re grabbing a bottle from the liquor store or ordering at a bar, try to get straight vodka – nothing flavored. If you must have flavored, there are a number of them that are zero carbs, but do your research online first! Many of the flavored vodkas have syrups and sugars added to them. Note: Absolut and Ciroc both cite that their flavored vodka does not contain carbs. Your experience may vary, so keep a close eye on your blood sugar levels if you choose to consume one of their flavored vodkas. Whiskey is made from fermented grain, usually combining rye, wheat, corn, or barley and comes in around 35 – 50% alcohol by volume. 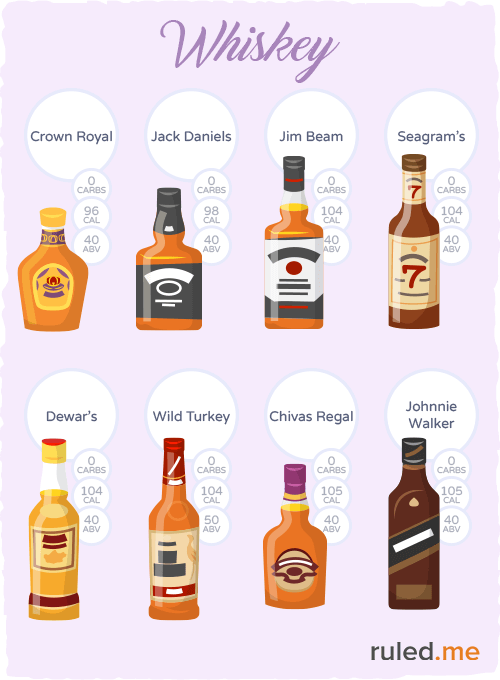 Even though it’s a dark liquor, all whiskeys do not have any carbs (or sugars) added – making it a great drink for someone on a ketogenic diet. Barrel aged whiskey has higher phenols and ellagic acid (combats free radicals) than red wine. Depending on where the whiskey is from is where the name is derived. Scotch, whiskey and bourbon are similar forms of this alcohol. Some don’t like the taste of whiskey for the pure harshness. If that’s the case, it may be better to use a milder alcohol like vodka. Most tequila is made from the agave plant and is commonly made at 40% alcohol per volume. There are not too many flavored tequilas on the market, so you don’t have to worry too much about added sugars or carbs. 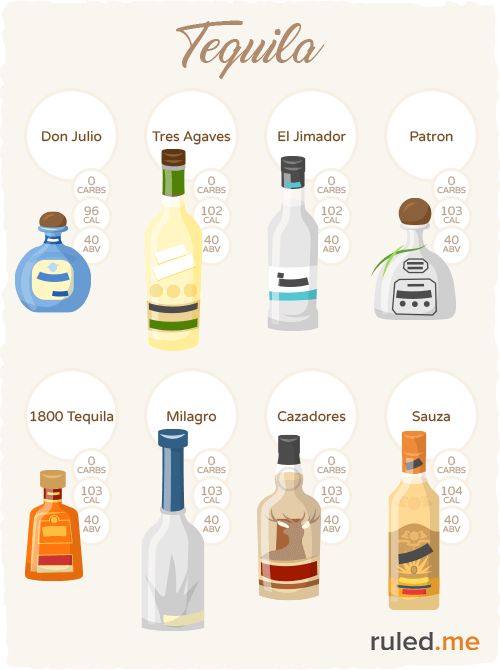 Note that some tequila producers do mix their tequila with other alcohols. Try to get tequila that is derived fully from the agave plant. The agave plant is grown in many places, but depending on where it is grown will affect how the tequila tastes. In highland areas, you may have a sweeter and more aromatic form of this alcohol. Rum is generally made from sugarcane or molasses, and comes in a variety of styles. It’s also zero carbs and zero sugar, but you need to watch out for flavored rums and rums with additives. Normally, the darker the rum the richer the flavor is, and the older it is. On average, rum comes in at about 35% alcohol by volume. When rum is first distilled, it comes out as a clear liquid. It’s then normally placed in bourbon barrels to pick up the oaky flavor and dark color that you’re used to seeing. The flavor and color from the barrels do not add carbohydrates. Gin is made from a grain base and typically runs about 35% alcohol by volume. It is normally made with citrus such as lemon, orange, or lime – but be aware of flavored or sweetened versions. Sloe gin is a common flavored gin that’s made in England and flavored with sloe drupes. These have added sugars, and therefore added carbs in them. 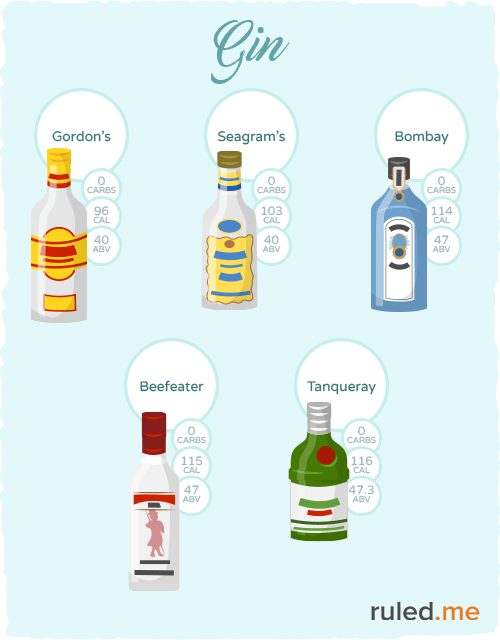 Most people think of a gin and tonic when they hear gin, but tonic and most common mixers do have carbs so you need to be careful. Brandy is made from the mash, juice or wine or grapes. 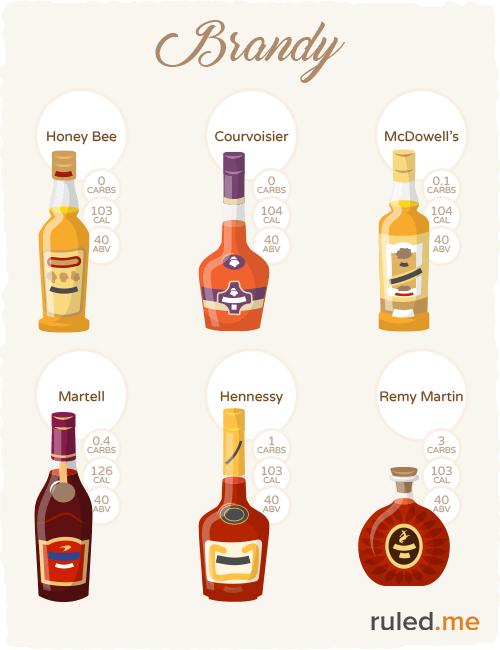 There are many types of brandy, but the most common is Cognac – a brandy that’s made in the Cognac region of France. Brandy typically ranges from 35-60% alcohol per volume, and are sometimes aged in barrels. Some companies choose to add caramel colorings to their brandy instead of barrel aging it, so be careful of added colorings as they can add extra carbs. Wine can be great to drink in moderation for the added health benefits (these come from the polyphenols, antioxidants, and resveratrol). 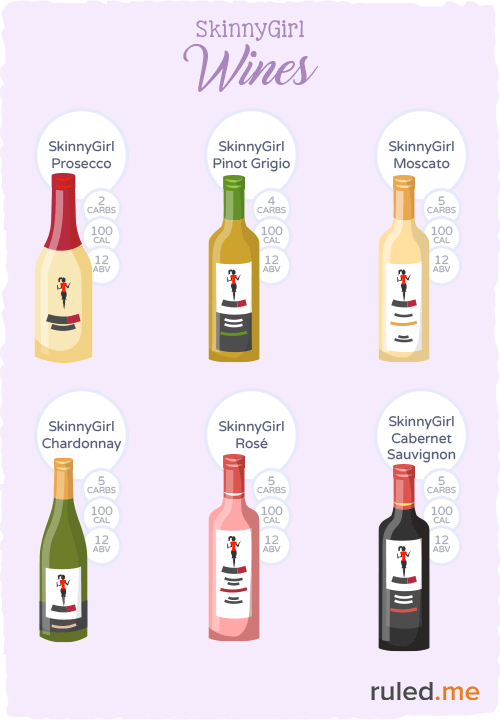 In general, the dryest wines will have the lowest sugar. They are typically harvested when the grapes are not fully ripe (and have less sugar content) and usually don’t use a process known as chaptalization (adding sugar to the fermentation process). 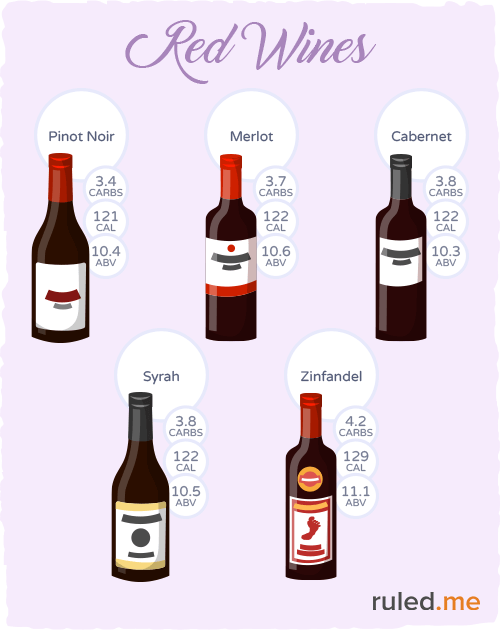 Red wine typically has the lowest carb count of any wines as well. If you see a wine labeled “late harvest,” they will typically have very high carb counts and should be avoided on keto. Red wine is closely tied to the “French Paradox,” a phrase that refers to the observation that French has low rates of heart disease. There can be some truth in this, as many studies have shown that moderate consumption of red wine can reduce the risk of heart disease and stroke. Though it’s important to note that over-consumption will increase the risk. 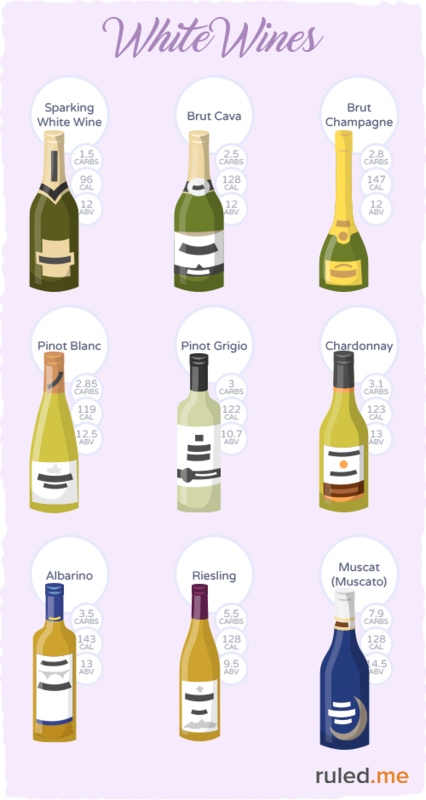 While most will tout the health benefits of red over white wine, there are some great reasons to drink white wine too. In general, there are higher levels of antioxidants in white wine and typically it will give less of a hangover due to a smaller concentration of congeners (byproducts of the fermentation process). * Dessert wines, ports, and sherries are sweetened and should be avoided. Beer is one of the most common alcoholic drinks that are not very keto friendly. Beer is packed full of fast digesting, simple carbohydrates and it’s no surprise that people have called it liquid bread. There are so many different brands of beer that it can be easy to order the wrong thing and accidentally over-consume carbohydrates. We recommend that even when drinking low-carb beer, try to keep it to a rare occasion. There are some low-carb beers that you can drink, though. Below, you’ll find a list of some of the more common choices that are served in US bars. There are even lower carb beers, but they’re scattered around Europe and pretty hard to find in the US. If you typically drink a few beers, aim for the ones with higher alcohol by volume – this means you’ll have to drink less in total. If you choose a beer with a lower alcohol content, you’ll have to drink more to get the buzz you want. In general, the darker the beer is the higher the carb count will be. Try to avoid any stouts and lager that are darker in color (especially those that are red, amber, or brown). Note: If you are gluten intolerant or have celiac disease, it’s important to note that beer is usually made with barley or wheat. This will cause reactions – so it’s best to avoid. Cider is primarily made from the fermentation process of fruit juices (more dominantly, apple juice). After the fermentation and filtration process happen, most manufacturers will add extra ingredients (typically more juice or sugar) to add a certain flavor element to their cider. 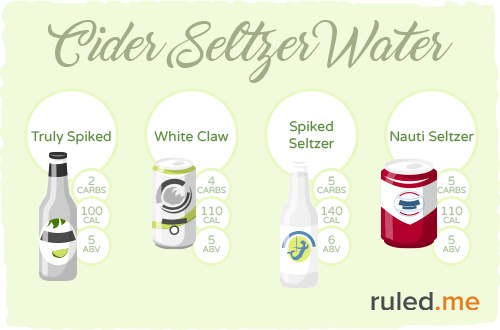 While there are no ciders that are low-carb, there are many brands that are releasing flavored seltzer water mixed with alcohol. These are typically as close as you’ll get to cider – but if you’re a true cider fan then it may not be a great alternative. Instead, think of it as a crisp and refreshing drink. Below, you’ll find some of the most popular brands with their respective nutritional information. If none of the above sound like a good drink, you can always get your own diet flavored sparkling water and mix unflavored liquor (like vodka) into it. Most of us that are on a low-carb, ketogenic diet know that sugar is in just about everything you can find. This also applies to mixers and chasers for alcohol, as well. Port/Sherry. These are also known as dessert wines and include all types of port, sherry, and sauternes. They have a very high sugar alcohol, commonly averaging over 13g carbs for just a 3 oz serving. Avoid these where possible. Sweet Wines. Much sweeter than dry wines, these are typically enjoyed with dessert and are a bit lighter than port or sherry. These include Moscato, auslese riesling, tokaji, and malvasia wines. They typically have around 11-18g carbs per glass, so you should avoid these. Sangria/Margarita Mix. Typically sangria mixes and margarita mixes have over 10g carbs per 1.5 oz serving (a shot worth). Avoid these as much as possible. Wine Coolers/Alcopops. 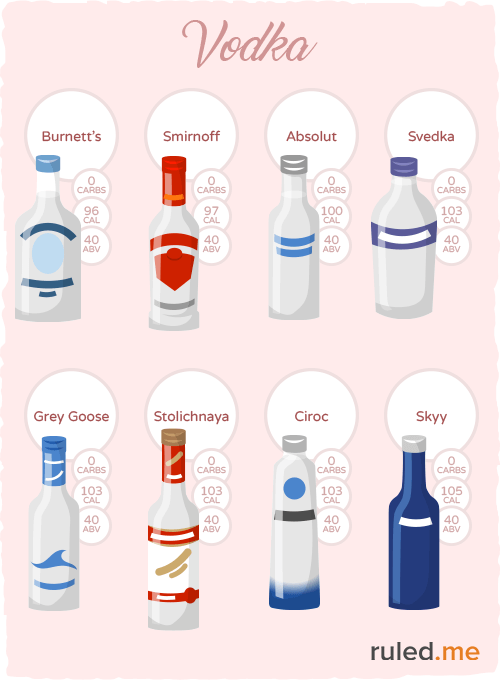 The most common of these are Smirnoff ice – they’re essentially sugar-laden soda with alcohol in them. You should definitely avoid these. Liqueurs. Usually a combination of alcohol and a simple syrup (made from sugar), these are extremely high in carbohydrates. 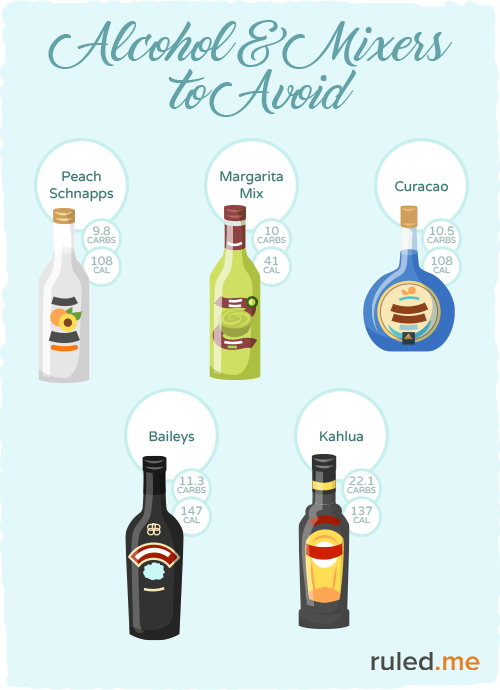 Below, you’ll find a full list of the most common liqueurs and their respective nutrition information. Fruit Juice. It’s very common for bartenders to make drinks with cranberry, orange, pineapple, tomato, and melon juices. Be very careful and try to stay away from cocktails as they commonly add these. Syrups. Similar to the syrups at coffee shops, these are typically made with a lot of sugar content in them. If your drink has any type of sweet syrup added (fudge, whipped cream, fruit “flavoring”), try to choose something else. Fruit toppings. Many drinks are topped with berries or have wedges of orange or pineapple in them. These aren’t too bad because you can just pick them off – just make sure that the drink underneath the fruit does not have any added sugars. Calories. Alcohol still counts as calories and will slow fat loss down. Alcohol is burned as a priority by the body. Tolerance. Most people on a ketogenic or low-carb diet experience a much lower tolerance to alcohol than usual. Be careful with consumption. Hunger. Many people experience heightened levels of hunger when drinking – this can lead to bad decisions (eating high-carb food) or just over-consuming in general. Dehydration. Since keto is a natural diuretic, you have to be watchful of how much water you’re drinking alongside the alcohol. Try to drink 1 glass per 1 shot and extra water before bed. Added sugars. Mixers, liqueurs, and many alcohols will contain some type of flavoring or added sugar. While many companies are publishing nutrition information, you should try to be prepared and research nutrition beforehand. We’ve read a lot of articles that mention drinking light beers and very dry wine to avoid carbohydrates, but don’t get our of hand with consumption. Some light beers can contain over 10g net carbs and some dry wine can average over 8g carbs per glass. It’s also important to note that alcohol does contain calories. There is no function in the human body to store the energy in alcohol, so your body will take a preference to metabolize alcohol over fat. Note: If you are on a ketogenic diet for weight loss, you may want to consider avoiding alcohol altogether. While you can consume low-carb alcohol and stay in ketosis, the ethyl will be burned by the body in preference of all other nutrients consumed. In other words, alcohol will slow down the fat loss process because a smaller amount of the free fatty acids will be converted into ketones. Besides this, alcohol does have an effect on hormone levels that are linked to belly fat and weight loss – so if you’re a heavy drinker, you can expect very slow or no weight loss at all. There is also a condition called alcohol ketoacidosis which can be deadly. It usually happens to people who haven’t eaten any food in a long period of time, and are drinking large amounts of alcohol in a short period of time. This can lead to dangerous levels of ketones in the blood, which can encourage deadly results.